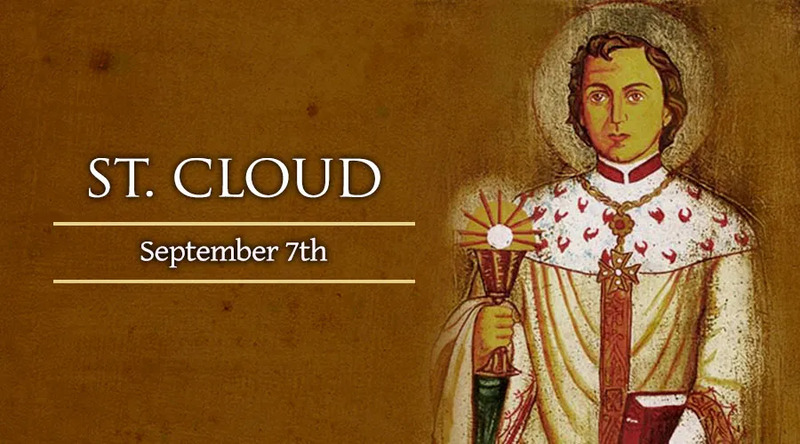 On Sept. 7, the Catholic Church honors the memory of Saint Clodoald, popularly known as Saint Cloud, who escaped from violent political intrigue to pursue holiness as a monk and priest. Born in 522, Clodoald was the grandson of the Frankish King Clovis I, whose conversion to orthodox Christianity – rather than the Arian heresy – made him the first Catholic ruler of present-day France. After Clodoald's father Clodomir was killed in 524, he and his brothers Theudovald and Gunthar were raised by their grandmother Queen Clothilde, whom the Church now honors as St. Clothilde. Forced into seclusion by the plot against him, the young man became determined to renounce the power and wealth that had brought grief to his family. Placing himself in God's service, Clodoald lived in a small monastic cell where he pursued a life of asceticism and contemplative prayer. He gave his inheritance to the poor, and eventually became a disciple of the hermit St. Severinus near Paris. No longer pursued by his uncles, Clodoald appeared before the bishop of Paris in 542. He formally received the monastic habit from the bishop, who cut off the long hair that had signified his Frankish royal origins. Clodoald eventually left Paris to live as a hermit in the forest for several years, growing closer to God in his contemplative vocation and studying Sacred Scripture extensively. During these years, pilgrims began making their way to the hermitage, seeking his prayers which were known to work miracles. Though he had left Paris to live in anonymity and solitude, the hermit now sensed a need to return to the city, where he was ordained a priest in 551. His two murderous uncles are said to have repented of their deeds during the time of his ministry. In 554 Clodoald returned to the monastic life, founding and leading a community of monks in the village of Nogent near Paris. There, he was known for his generosity toward the poor, and his attention to the work of religious instruction among the people. He died on Sept. 7, 560, at the age of 38. Under the name of “St. Cloud,” Clodoald became the namesake of several cities and towns. These include the Parisian suburb of Saint-Cloud, and later St. Cloud, Minnesota, whose Catholic diocese has been placed under his patronage.